A few quiet days, how wonderful! Ha, the lights in the kitchen work again, as I bought us two new bulbs for it. Yesterday I did practically nothing at all, fantastic! But today I will have to be more energetic. There are a few grocerie things I must get us, then the room needs a vacuum cleaning, have to prepare a form to be send away soon, so my day is pretty filled, but I don;t mind. We could do with some better weather, but in the whole we shouldn;t compain too much. Everybody heard on the news the terrible event of the German plane crash. Aweful and totally uncomprehensible why this guy did it. Perhaps we will never find out the why. But let's not swell too long over all the aweful things that are happening in the world. Of course you should stay aware of them, but at times you just have to shut your mind off and forget for a while about it. So this evening Jan and I will watch a nice program called "Popstar", all about people showing an act with puppets of all kind. I have found a couple of links for you of acts that I really liked. First is of a lady with a group of about 30 children, performing a song of The Lion king. The lady who is handling the monkey, made ALL puppets and everything herself! Amazing. The second one is of a young guy, performing an act of a nurse, "talking" to an old lady in a nursery home. I really had tears in my eyes during this act. It is done with soooo much empathy and kindness and love, and I just LOVE the puppet he made. I am sorry about the advertisements that are showed first, but try to skip them, and it will not take long. I applied yesterday by mail on anther volunteer job, would be managing the reception of an organazation for language aid for Dutch and non Dutch speaking citizens, so a bit in line with the other thing I am having an info evening abut, but at the other end of it so to speak. It would be answering telephone, handing out lessong material, keeping up present lists of the "students", and such. May be I will have an interview for that too. Well, social security cannot say I am not trying to find something. And it will be good to mention to my volunteer job coach at the appointment I will have on Monday. In between all this, I am working on two kits, but they are progressing a bit slow. Never mind, as lng as I doing a bit every time I have some free moments and inspiration. 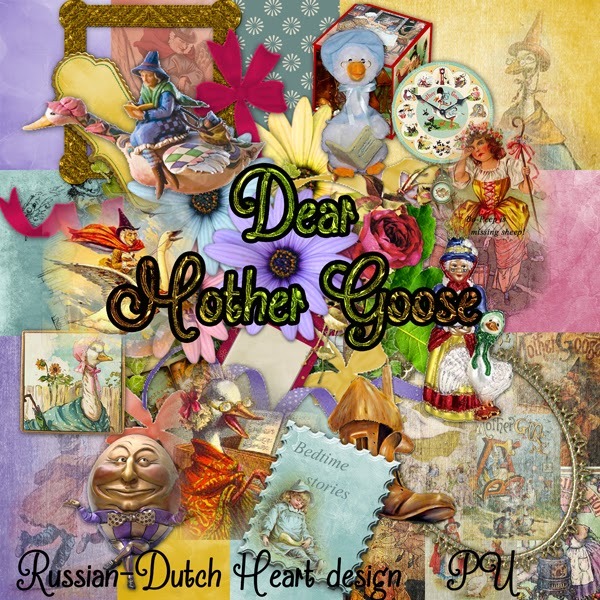 Today i have the first download of a new kit named "Dear Mother Goose". 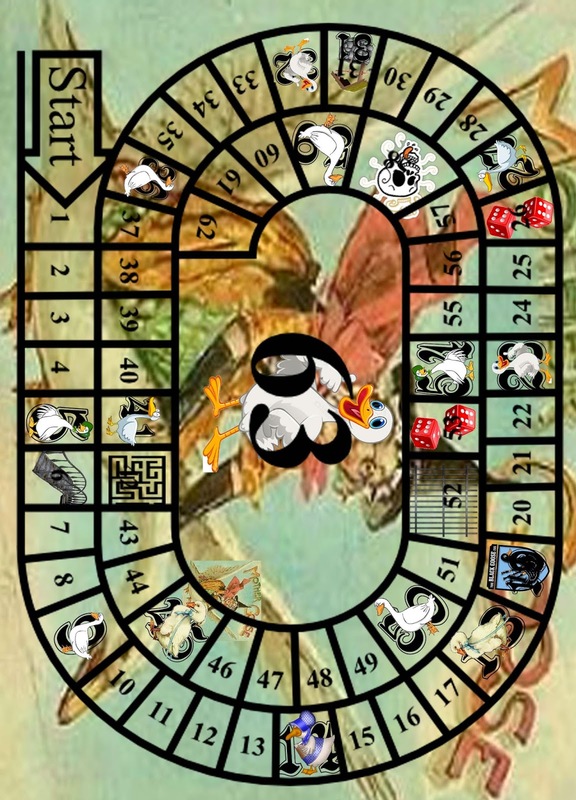 I even have made you a playing board that you can print out to play the game! With the rules to. Perhaps fun to play it with your children or grandchilren.That will be in the second download. But I can show you the board already. So I am wishing you a terrific weekend, crossing my fingers we will have a quiet one too this time LOL! And here the preview of the whole kit and link to first part. New appointments, new chances, running here, running there! Gosh, there are times, it is so quiet here and other times every day there is an appointment or necessary thing to do. Monday I went to the information meeting for a possible volunteer job, but I didn;t apply. It's just not a thing for me, I thought it was more about a course where you learned about helping people with their budgetting, but to me it looked more like a talking group about it, and of course everybody can learn about it, but it's not in the way I thought it was. But I already have another option, which is more my kind of thing, I guess. I will go the 7th of april to a info meeting for language volunteer. That is a short course about how to help people with trouble to understand Dutch and help them to learn it better. In way of understanding forms, or letters from e.g. councils, or to have a simple conversation and such. 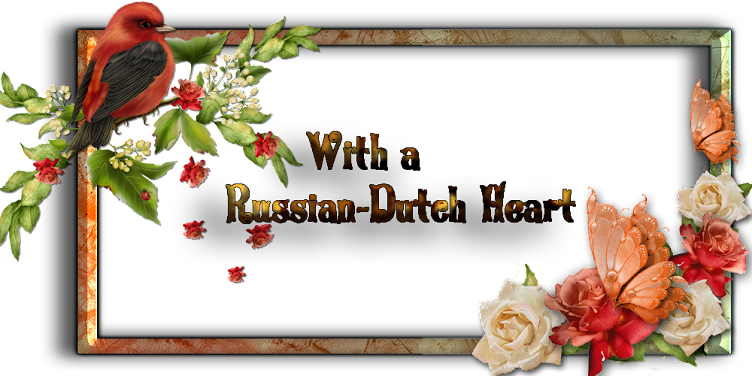 It's for Dutch people who have problems in e.g. writing simple letters, or reading a story to a grandchildand such, but also for people of other origin, who want to learn our language. I think it wil not be so easy, but very interesting. And after finishing the short learning process I have to do, I assume I first will be an assistent to a language teacher, which is fine to me. Yesterday evening wasn't quiet all evening, because at some time, Jan went to the kitchen, switched on the light and BANG, the light went out, probably a bulb that gave up. Normally no problem, but suddenly a part of the lights there couldn;t be switched on again. Okay, may be a fuse that gave up. but it took some time to finally get all back in working order. At the end all worked again, only not one bulb of the ceiling light in the kitchen. So Jan will have to buy a new one today. Pffff, I was looking forward to a peaceful evening, without happening anything, but no. It sounds not like much, but as we already had a bad weekend, Monday I had to go to that meeting, iot was a bit too much and a nice evening without any event would have been nice LOL. Okay, today we have another chance, hahaha. Jan also made a phonecall to the home where he has his volunteer job, to explain the whole situation, and said he wouldn;t come to work this coming weekend, he first wanted to do the echo he has next week and the appointment at surgery after. I think he is being sensible, not risking a new visit to ER. 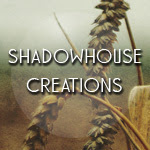 With all the appointments to think of, the "normal"business of a household in between, I have but little time to spend on designing at the moment. And when there is time, I am nt always in the right mood. Oh well, some day all this will be done with, hopefully and life will take an easier track to follow, more organized I hope and for a while no more forms to fill in and wait for decisions or government or council etc. and then I will have more time to follow up emails, answer them properly, because I have the feeling some people think I forgot about them, which isn't true. I just don't have the relaxed soul at the moment to write back to them, so everybody who is thinking I don't know them anymore, please know I am thinking of you and will mail you again as soon as possible. . The weather isn't too bad but not good either. I have the feeling spring is pushing but has not yet enough force to come through the door, grin! Still, whenever there is a moment we take a quick look into the garden and see that in spite of lacking of warmth and sunshine some of the seedlings really try to become a little plant. Amazing, how strong nature can be. The ones that look like starting plants, aren't yet big enough to re-pot, but it is looking hopeful. So perhaps in a couple of weeks we suddenly have a lot of work to do in the garden again. Can't wait till the first day comes that we would be able to sit for a moment in our chair there, if only it would be for an hour or so. Patience is needed, hmmmm, that's difficult LOL. Today is shopping day, I am running out of bread and cat food and almost the coffee(cannot do without that hahahah), and probably some other things too, so i cannt linger all too long here anymore. 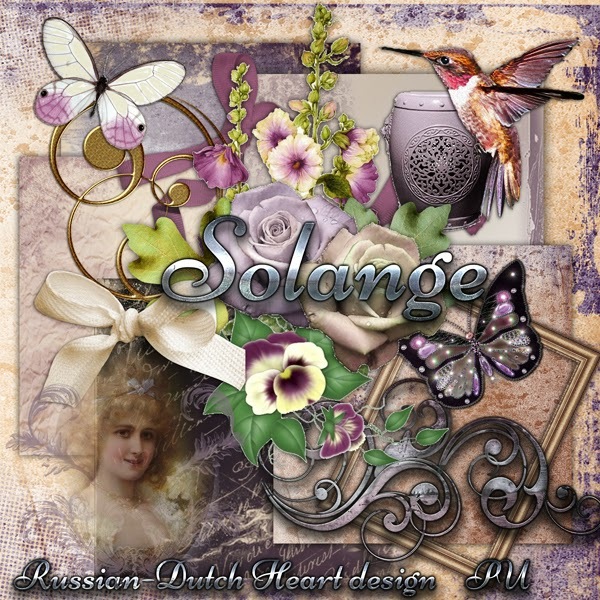 I have for you the clusters from Arlene, made with the Solange kit. Wishing you all a wonderful day and thanks for keeping up with me! Probably this is a good morning, after the weekend we had. Where to start ? Saturday afternoon Jan went to his volunteer job again, seemed to be fairly okay. When he was gone, i did a quick vacuum cleaning and some stuff, then sat down to watch some tv and wait for Jan to come home. Then I would make us a quick dinner and we could have our Saturday evening with lots of nice programs t watch. Nothing of that happened. At about 7.30 p.m. I heard the front door, so Jan was home. But it took a rather long time before he came into the room. And how did he enter the room? He could barely walk and had lots of pain by reading his face. What happened? But the end of his shift it seems his belly, specially the umbilical hernia, was acting up, probably causing a pinching of an intestine. He had that about 3 weeks ago also. So after sitting down for a few minutes, I said to him we had to go to ER (emercency department)and he agreed! The stupid man said we could go by tram. Well, no way I said. He barely could stand upon his feet. So I called Heidi to ask if Danny, her husband could come to us and bring us to hospital. No problem, within 10 minutes they were there, both of them. We came to ER, were lucky it was quiet and then was called in rather quick. First of course all kind of research was done, and I felt such a pity for Jan, he really was in agony and his belly button really didn;t look good at all. All hard, peeping out as a marble, strange color. They couldn;t give him a pain killer right away, because he cannot have many that will go well with his medicines. To make a bit short story after about two hours ( I already sent Heidi and Danny home), there came a doctor to examine him, and she managed to release the pinching and the belly button suddenly popped back and it also ended at once the pain Jan had all the time. Then she asked him to stay there for about half an hour, to see if all went well, came back after that time and said he could go home to sleep in his own bed, but had to come back right away next morning at about 9.00 p.m. for a check up. They wanted to see if Jan stayed without pain and fever( he didn;t have any fever all the way),. If not there might be needed an operation. Well, we went hme, Jan all pooped out but without serious pain and we even did manage to have some sleep during the night. Went back next morning, and now he has an appointment for the surgery ward, where they will look at the scan he will have next week and talk about possible operation to to close the hernia. I hope it will be done, now that it is still small, because if they don;t, Jan may experience ofter this agony coming up, and it can become even dangerous. So after we had the appointment and check, we could go home again. Pfffffffff, we felt a bit relieved. But we both felt so tired, that soon we took a nap at the couch, mine was for about two hours, Jan took a longer one and I left him sleeping, it was probably the best for him at the moment. Glad he has now the appointment at surgery so quick, and hopefully something will be done, because he cannot go on like this of course. Now I will have to try to keep a good eye on him, and make sure he doesn;t do too much of anything, and that isn't easy! For now it's oaky agin, let's hope it will stay this way. Today I must go to the information meeting for a volunteer job. I must say I am not feeling all bright and shiny, but I will go there, of course. Let's see if this job will be something that I would like and also will be something I am able to do. As you can imagine, I didn't make the dinner I planned yesterday. We had the one I planned for saturday evening and today I dont have enough time to be in the kitchen, preparing the pork steaks along the recipee I have found. Doesn;t matter, I will make something different today and perhaps tomorrow the pork steaks, LOL. Today I have a bit smaller kit for you, named "Solange". Bills that could give you a heartattack LOL! Yeah, yesterday we had a bill in the mailbox, that by opening it caused a reaction of unbelieve. Every year we have to pay, what they call, an own risk percentage on medicins on top of the health insurance premiums. So every time as we have to go to the drugstore for our necessary medicins some time later we receive a bill from the health insurance company. Most of the time it are not too high bills, but yesterday it was a real substantial sum. Looking through it, it was one of Jan's medicins, but there is no mention for which one. Jan right away was angry and calling a bit names, declaring that all medicins should be payed by the insurance company, etc.etc. and I better don't try to explain it once again to him, that till we reach the "own risk"amount we will have to pay a percentage. I advised him we should go to the drugstore to inform for which medicin we had to pay so much. So we did and now we know and he can talk about it with hs specialist on his appointment in april, to see if there is another brand or type of medicin that will do the same work, but will be much cheaper. All have to pay the own risk per person of € 375,00 a year, which a lot of money. One good thing is that Jan already is almost on 2/3 of this amount and after next time he will have his medicins at the drugstore, we still will have to pay a sum, but then after he will have them "free". But it's no miracle that many people are getting into financial difficulties with health premiums and that own risk. Specially with the crisis still going on and an immense amount of unemplued, who just have a very basic income. After the visit at the drugstore we went to the voting for the Provincial government stuff. The location for it was very near, but it wasn't a pleasant walk, because the weather was cold, cloudy, even a bit of mist, and cold wind. Quite a difference to the day before. Yesterday I did a little shopping and home again I changed the bedsheets, always a "heavy"work, but happy again that's done. Today I will have to make a phonecall to know when I will have to go to an information day about a volunteer job. I was there last week and the lady sadi she would mail me for details but till now I didnt receive anything. So I better try to contact here to know if it is still on or not. This afternoon Jan will leave again for his volunteer job, so I will have to think about what I will have as dinner. I am sure i will come up with something that is quick, easy, and tasty. Don't want to spend long time in the kitchen today. I am always trying to plan a bit ahead during the week for dinner, which sometimes even works well LOL. Sunday I will make real dinner, although Jan has to work then too and will be home at about half past seven in the evening, so we will have dinner rather late. But I think I will try a recipee I found for a kind of pork steaks. Normally I make a stew with them, to get them tender, but now I've found somewhere a recipee that will take not too much time and looks delicious. I will try it out first and when the result is good, I will give you the recipee. Perhaps I will make a quick visit to town centre early afternoon, I am in need of some knitting wool for the project I am working on. Hopefully the shop in town will still have the color I need. I think I will not linger very long there, till now weather isn't looking great. Perhaps I will pop into a new store there of which Jan told me. They seem to have lots of nice clothing there for a real low price. If I see a nice sweater I might be tempted to buy it( I can do with a few new ones), although to be honest I cannot spend very much money at the moment. Specially not with all those "surprise bills"coming in. Oh well, all will be sorted out and done with in time somehow, I guess. What about an freebie, or even two? I was right the other day about Arlene's add-on for the From the Sewing Room kit. I didn;t make the preview yet and no upload. But I took care of that yesterday and also have here fantastic clusters for the Friends in Secret kit. 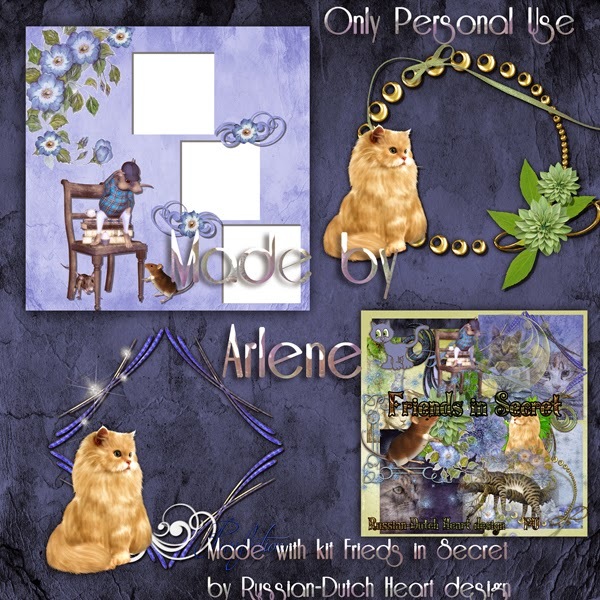 By the way, Arlene has a new freebie for you on her blog, and also a new kit on Etsy, so pop in there to have a look. Okay, time for me to get a little bit active, so I leave you with the wish for a wonderful weekend! Election day and great weather. Yesterday it was a lovely day, filled with temperatures about 13-14 degrees C and sunshine. So I did a bit of garden work and went out for a couple of things and did that really realxed, enjoying the lovely weather. Monday I was rather busy in the house. I did a laundry, ironed all that was dry, arranged it all in the closets, mopped the floor of the kitchen and had a telephone call that was a bit embarassing. As I was busy in the kitchen Jan came with the phone and asked me if I had an appointment that day with the participation(volunteerwork) coach. I was all surprised, couldn't believe I had one. Then I looked in my file and saw I totally had forgotten about it, I just didn;t put it on the calendar. I told the coach I really was sorry and felt very guilty. ( I am very punctual normally about appointments, really). I also was lucky I already had an interview with a volunteer organiation and have an appointment there again. Well, he forgave me and I have another one in two weeks. And yes, I wrote it down on the calendar on the wall immediately! I was also lucky the guy was so nice to inform by phone, because not showing up on an appointment can have consequences for the social security money, like a penalty in less money! That settled I wsent on in the kitchen LOL! And yesterday I could sent all papers to my accountant for the taxes, another weight off my shoulders, yippee! I just didn't receivwe one paper, so I wrote to my accountant that I will send it as soon as I receive it in the mail. And yes, of course, just having send the envelope that day in the evening post there was the necessary paper! Okay, I will make a copy today and put it in the mail. Today we will have to go to a voting office, because we have the election of the Provincial state members. That always is a bit peculiar, hardly anybody know the canditates for it, but it is a rather important election to participate. The members of the Provincial Senat choose the members of the Upper House(we call that the 1st chamber). I have a link for you if you are interested, where quite good is explained why this is important. I hope a lot of people will take the trouble to give their vote, it can be a sign to the Coalition who is governing the country that people aren;t all too happy about a lot of the measurements they take(or not). Oh, Monday evening we were watching a serie we love to follow, called "The Blacklist". It seems that the serie has a lot of viewers, and because of the succes there will be made a 3rd season of it. I am really loving the maincharacter, Raymond `Red` Reddington, played by James Spader. Always a pity that a chapter is so short, and it always leaves you behind with a kind of riddle or question, and then we will have to wait another week for a next chapter. Frustrating sometimes ROFL! Well, I hope the bit of mist we are having nw will disappear soon and that the sun will come back. They forcasted today another lovely spring day, so Jan and I should take advantage of it in one way or another. 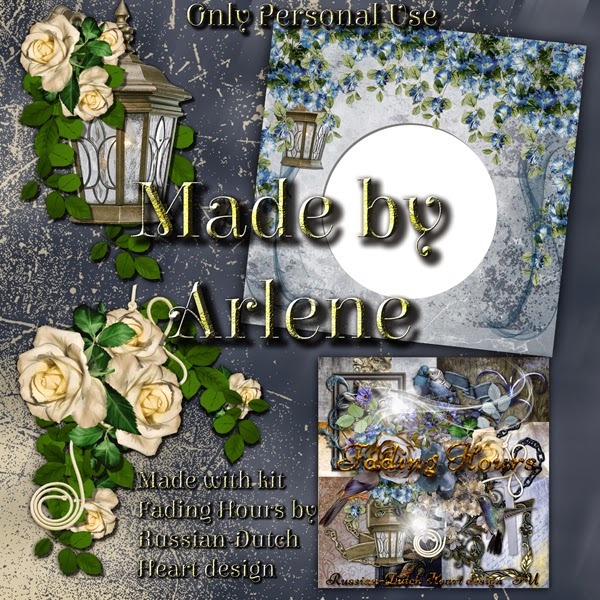 Today I am posting another kit, and not clusters from Arlene made with the From the Sewing Room. I´ll have to check, why I didn`t make a preview and uploaded them, so girls, sorry, but you´ll get them later okay?Although it seems we have a rather quiet, may be to a lot of you a whee bit boring, at the moment for me it feels kind of hectic. So I think that is the reason I am not always on track with the kits and the add/ons. It will go better, I am sure, and we will get into `peaceful water`again hahahaha. 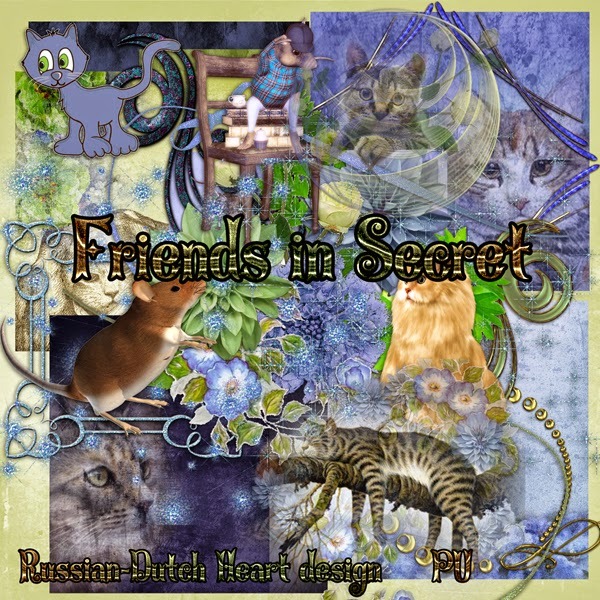 Now here is `Friends in Secret`. Have fun with it. And also have a wonderful day! Another weekend passed with Jan working. I am not yet fully adjusted to it, not having him around at dinner time. It´s more or less lucky that it is n Fridays, Saturdays and Sundays, because on Friday and Saturday I usually don+t really cook, or we have a simple thing, so it´s not too akward. But he seems to like the work, it is not all too straining, but after being there 6 times he is getting to know the elderly a bit, and even has time to have a little chat every now and then with some of them. In the weekend it was rather cold, for most because of the northern wind blowing, and the next days it still will be from northern directin, but will blow only softly, and they are expecting a lot of sunshine and we even might reach around 14 degrees C. Oh what a lovely news for our garden and specially the seeds that need some sunwarmth! Jan even sow more and now we are having a pot in the room near the radiator to keep it warm, with seeds of tomatoes. Last year our tomatoe plants did very well, so I hope this year too. I only have bought another species, you always should try out something new. As I didn´t do all too much during the weekend, I think today I should be more energetic and do some ironing, a laundry and sorting out a few papers to copy them and send them to the accountant for the tax stuff. 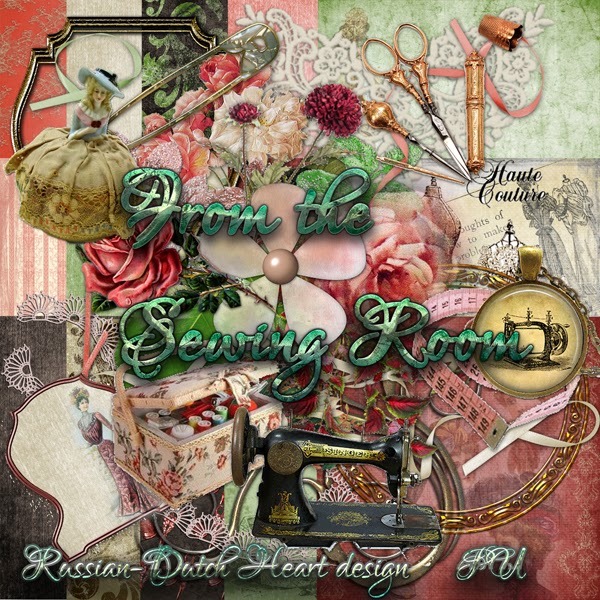 So I will not linger too long here and give you the second download of the kit `From the Sewing room`. Lately I had suddenly some trouble at Medifire to copy the download link. Normally I choose `share`and get the link and then I can copy it to the clipboard. But suddenly that was impossible, which is not handy at all. Lucky I could do it via IE(I normally use Firefox), but yesterday I searched on the net to find may be a solution for it and I found it. You just tap 5 times the shift button and then the miracle happens, I can copy to the clipboard again. Yeah, such a simple thing, but it works. Just have to see for how long, but at the moment I am happy again LOL. Interview and visit to market. yes, I am posting this late, because this morning I took my time to get ready for the interview. You know, picking out the clothes, having a shower, a cup of coffee etc.and then time goes quick. and had a nice conversation with the lady there and I will go to a meeting later this month, where they will explain more in detail the work they do(with almost all volunteers!) and then I can decide if it is something I am able and like to do. If not she also can introduce me to another organization, so we will see what comes of it. As the location was very close to the market, I walked to it after the interview, picked up a few things and then walked home again. And when I entered the room I saw Jan's brother sitting there, who payed us a visit after a long time. Well, might have been good that I was away, so Jan had time to chat with his brother. Now Jan has left too, to go to his work again. So I have peace and quiet at the moment, and how wonderful it is, to sit in a silent room, LOL. No tv on, not even radio, just silence. It doesn;t have t be like that all day, but just sometimes, I love it. I was in the garden this morning, just a bit looking around, and of course inspected all the sowing stuff. Amazing how that can grow in one day! So I am sure some of it wil come to bloom too. Yesterday I planted the dahlia and gladiolus bulbs, crossing fingers they will do as well as last year. And now slowly the garden is coming to life and starts to look again like a real garden. Jan also pruned again a lot of the ivy, which is always growing as mad and needs a lot of cutting back. That's about it for now, I will probably do a little game or some blogreading and then will make myself some pancakes and will eat them with iced sugar and some other with sirop, and oh, sometimes that tastes soooooo good. Jan will have dinner when he comes back, he will just have to cook his meat and can have it with a roll. I think tomorrow we will have wraps, with minced meat, corn,onion, some garlic, tomatoe and grated cheese and I can give some creme fraiche with it. Kit for today is part one of "From the Sewing Room". Hope you will like it. Monday morning jan was at the hospital appointment and cam eback more reassured. His doctor said to him that he should have come when he was feeling so bad the other week, but she knw him too, LOL. Jan was able to spit out some questions and got some answers. Result of all is now, that a complete checkup he would have in june has been persponed to april, which I find a good thing. That done he will have another appointment with his doctor to talk through the results and hear what actions will be taken, if necessary. I could tell, he was feeling better after his appointment, because he went to the market later that afternoon and came back with lots of fruit and veggies. And back home he occupied himself with some sowing and also yesterday he spent some time with it and also in the garden. Some of the seeds already sprout and if 75% of all comes up, we will have a small problem. Don';t know where to put it all LOL! Monday afternoon I went out to copy all needed, and yesterday I copied the actual two forms of application and could put the whole envelop in the mailbox( and it was a thick envelop!). It felso soooo good to have that done. Now another one needs to be done, but that will be easier, because I have all needed papers already together. Just have to sort ut which ones I really need to copy and attach( yeah, this form doesn;t need exactly the same ones, sigh!). But I was so happy about the first that I tried out yesterday a recipee for cauliflower, Jan brought from the market. and it is a good, tasty and easy one. Cauliflower cut into florets, mushrooms sliced, tomato into small dices, chop onion. Cook cauliflower with some salt for about 10 minutes , should not be overcooked. Melt butter in skillet, fry onion, then add mushrooms and tomato and fry gently for a couple of minutes. Grease baking dish, spread over the bottom musroom mix, drain the cauliflower and add above the mix. With butter, flour and milk make a roux and add some of the grated cheese to it. Pour over the cauliflower, let gratin in the oven at about 200 degrees C. for perhaps 10-15 minutes. Is delicious with fried potatoes, or potato gratin or french fries. You can have this meal with or without meat. I think Jan and I will spent a bit of time in the garden, weather is rather good for it at the moment, although you need to have a warm sweater on. We need to replace a few pots, clean them out, put in new soil, figure ut where we will put our dahlia's this year, etc. I must say, Jan is the most active in the garden. I still don;t feel the real "urge'to get busy there. But I am sure the spirit will come back quickly, when I really start doing something there. 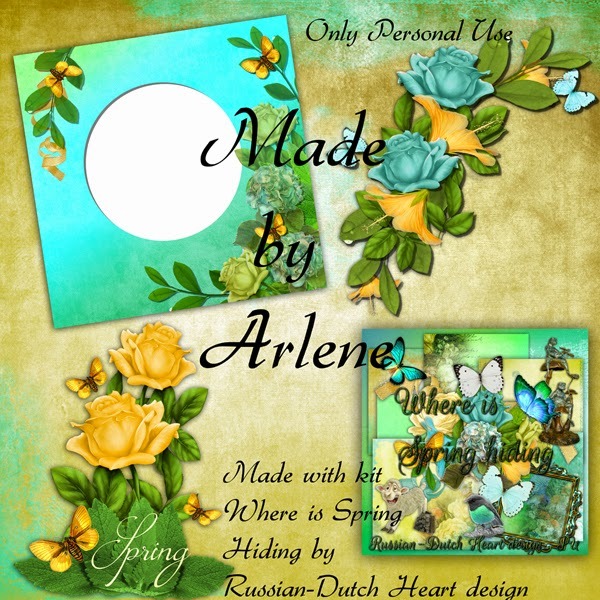 Abut time to finish this post, not without a wonderful freebie frm Arlene, made with the Where is Spring hiding kit. Forms, papers, almost ready, finally. Well, I am waiting a bit writing this post, till Jan has left for his hospital appointment. I really hope he will have a good conversation with his doctor and that some answers will be therre and perhaps an appointment for a total check up(that i would like to hear most, honst). This weekend though, Jan felt good enough (well, he said so, did I believe him? May be for 75%, hahaha) to go to his volunteer job. It all seemed to be fine, he enjoyed himself there, isn't overloaded with work, but you can imagine that Sunday evening he was pretty worn out! He isn't used anymore to be on his feet for almost 3 hours, walking short distances, but being busy all the time too. But I am sure it will go better after he does it for several weeks at a row. It also depends a bit on his physical condition, of course. I am a tiny little bit proud of myself, HA! I managed to fill in almost the whole form I was busy with, and found all the necesssary papers for it that I will have to copy. So that done, well, almost, it feels like a relief. Now I still have another one to do, but it will go quicker, now that I have all the papers together. You could say I almost hate those things, but it has to be done. How happy I am that I will nt have to do the taxes! It costs a bit of money, but saves a LOT of stress and such, so I am quite willing to pay the accountant! Not yet ready to send him all, because I am still waiting for one annual statement , already mailed them a couple of times, seems they had some stagnation in it, but if I don;t have it tomrrow in the post, I will mail them once again. This Friday I will have an interview for a volunteer job. Well, we first will see what is possible and what they have, but may be it is something I really will like and am able to do well. And then I hope life will settle itself a bit and that we will have more quiet and peace for a while, no more forms to fill in, no more running around to offices for all kind of things, just a quiet life, with some nice things to do, and with spring looking around the corner, some quiet hours in the garden. Oh, that will be a good feeling. And to feel something of spring( I know, lots of you are still in mountains of snow), to just know at some time weather will be nice and sunny again I have a "springy " kit for you. I love the colours of it, so fresh and happy. 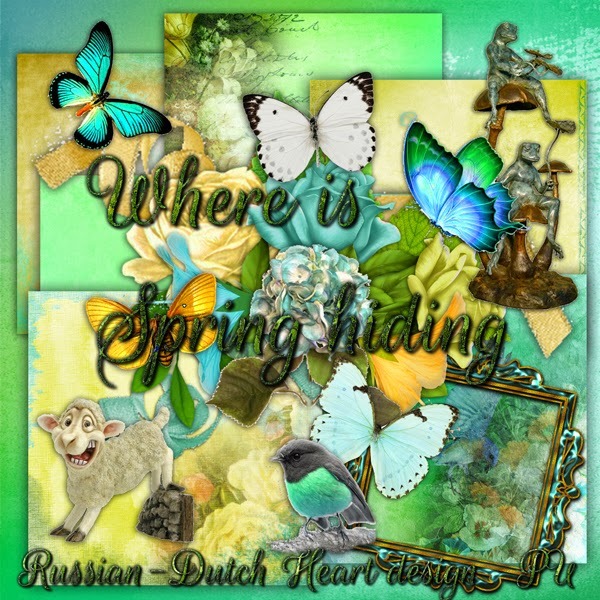 I named it "Where is Spring hiding" LOL! First I am glad to say Jan is feeling a lot better, but I am not yet completely convinced that all is ging well. Still, we are happy it is going lots better. He didn;t yet had a phonecall with his doctor, just because she has no visiting days, but i hope he will try to get her on the phone and may tomorrow can go to hospital to her, we'll see. He also phoned the volunteer place, to say he will be there this weekend. I wanted him to wait to g there till he had an conversation with his doctor, but okay, if he feels up to it, he should try it. Then Monday I had an interview with the participation fellow, which was real nice. He already had a couple of ideas of work that might be fitting to me, and he just called me that I might get a phonecall these days from a lady, who will invite me for an interview. It's nice to see this coach really is trying to do something for you, and I think he is good at his job. Now it's up to me and the organasation I will go to if we can match. In the mean time i was busy yesterday with sorting out all kind of papers I need to copy to may be get a remission of certain taxes. But oh my God, you cannot imagine what they ask you on their forms, and how many things you have to send in. I should think that they have most of it already, but it isn;t making me happy and then, f course, I cannot find one or two things needed. These papers will be somewhere, but sometimes I am a bit chaotic and put them somewhere with the thought: "if I need it I can find it here", but it doesn;t work LOL. I will at some time get all papers together, then have to copy them and send all to the council and have to wait for their decision. I am counting on nothing, but who knows, perhaps we are lucky for once. And I promised myself one thing. From important forms I will make directly one or two copies at the least and put those in a "copy"file together. It will make things easier in future. Funny how I am a bit untidy concerning my own "administration", however when i had an administrative job, I had it all really good organized, new where I filed it, with what, when etc.etc. But in between all I also did some designing again, the flow is nice, not in top speed, but it works. I think today I first will try to find all papers, fill in the forms, then also need to do a little bit around the house and i think that by then it will already soon be time to get dinner on. Oh well, it will all be done, somehow and sometime (GRIN)! May be tomorrow afternoon I will go to Heidi, to have a proper chat again. I had a phonecall from her yesterday evening, and first wanted to go toher this afternoon, but the girl is so busy, and then most important, Danny, her hisband, will be working at hme, so then it'snot a god thing to go there and chat with Heidi, hahaha. We two need a quiet time, just the two of us, then we can talk about all we want, without interference. Girls just need to have such moments from time to time, isn't it? 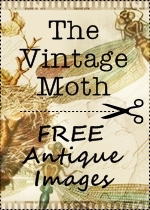 Time now to finish this post, and get busy(although slowly, first need another coffee and then I will try to get started). 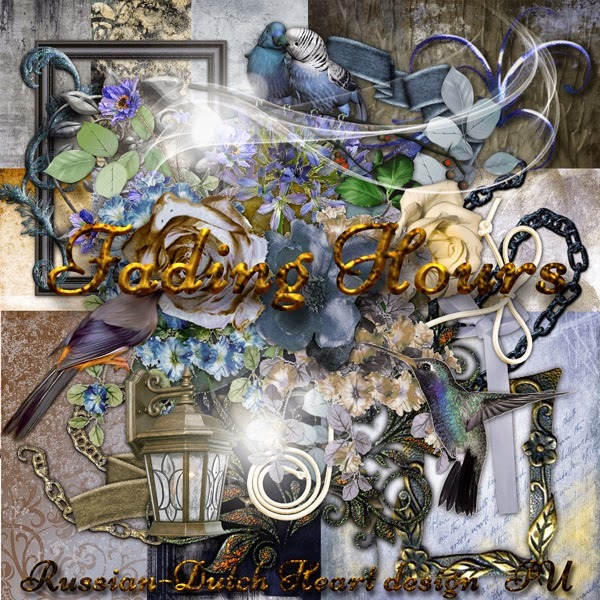 I have the second part of the Fading Hours kit for you. I am lucky it isn;t far away, I think it takes a 15 minutes walk, and for nw it looks rather good outside, sun is shining, a bit windy, but okay, if it stays this way I am happy. Jan is feeling much better now, but you know me, I am in these cases a worrying type and not completely reassured yet. May be I got his so far he will make a phonecall to his specialist in the hospital today or tomorrow to perhaps have an appointment wiht her and talk it through. It would make me feel much better. I had a quiet weekend, didn;t do to much, well, after that bad night and part of the day following, I guess I had to take it easy. But I did some laundry, and did also some designing, finished another kit and felt all happy about it. Might sound a bit strange but I am looking forward to watch tv this evening, because then is anther part of a terrible thrilling series we are are watching. So good it is on 4 days a week, and not just once a week LOL. May be you heard of it. It is called "Missing" and is full of mysterie and thrilling events. Rebecca Winstone is a woman raising her son, Michael on her own following the death of her husband, Paul. When her son goes to Rome, he disappears so Becca goes to find him. 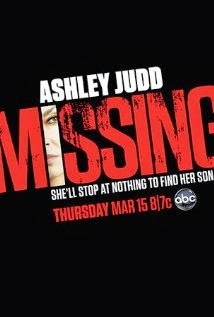 She then discovers something from her past is come back and is the reason her son may have been kidnapped. She and her husband were CIA agents. She has to deal with men who are trying to capture and/or kill her. Her actions get the attention of Dax Miller, a CIA agent who wonders what she is doing so he pursues her. So she goes all over Europe trying to find her son and along the way she discovers her husband might no be dead. 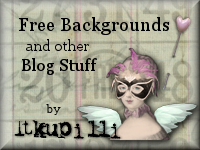 Okay, that is all for today, ony need to post your freebie. as far as I can tell, I didn;t post this one yet. It's named "Fading Hours".